More than six months after release, Final Fantasy XIV still has no monthly charge due to the unfinished state of the game. When Final Fantasy XIV was released back in September 2010, complaints from players led Square Enix to admit that the game had some major issues. The company extended Final Fantasy XIV's free trial period for 30 days, hoping that'd be enough time to sew up its wounds, but it wasn't. More than six months later, Final Fantasy XIV still comes with no monthly fee. In early 2011, Square Enix removed original producer Hiromichi Tanaka from the game and replaced him with Naoki Yoshida. Speaking to Gamasutra about the sticky situation he's in, Yoshida said that Square Enix won't charge for Final Fantasy XIV until it's in a state where he himself, as a player, would want to pay for it. That point is still "out in the open," Yoshida revealed. Yoshida also went into the types of changes that might be necessary, both major and minor, giving us an idea at the task Square Enix faces. For example, he believes Final Fantasy XIV's quest system could use some minor tweaking to satisfy a wider audience. On the other hand, Yoshida says that a "70 percent change might be necessary" for Final Fantasy XIV's battle system to get it to an acceptable point. These are just two examples of many areas Yoshida wants to improve. Square Enix is able to take its time with Final Fantasy XIV because the game is self-funded and doesn't use any money from investors. Were this not the case, Yoshida says that the situation would be much different with regards to a monthly fee (or fees in general). 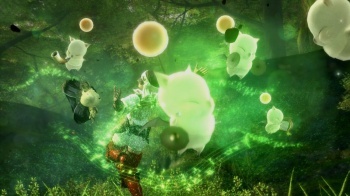 As it stands, Yoshida is able to implement both long-term plans, like his battle system ideas, and short-term plans, like those for the quest system, without charging unhappy players. However, you've got to wonder if Final Fantasy XIV will ever recover to the point where it earns Square Enix a profit, because Yoshida's words seem to hint that it could be another 6 months or longer before fees are implemented. I guess it could always go free-to-play.